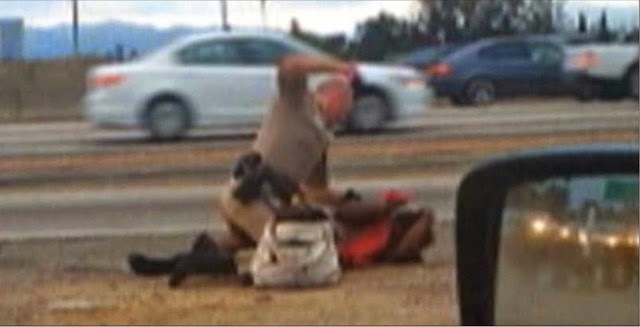 LOS ANGELES (FinalCall.com) - There is no sound but you almost hear the thud of blows landing on a Black woman pinned to the ground by a bulky California Highway Patrolman. You can almost feel the woman’s head bouncing off of concrete as an unstoppable force smashes into her face. Those images brought an explosion of outrage from the woman’s family, family attorneys, leaders, politicians and grassroots activists. Each weighted punch has contributed to demands for accountability and transparency. They want the officer fired and charges filed against him. They want a federal investigation. They want justice. “I feel like in general there’s this escalation of attacks on our Black people, but not just us, also the Latinos as well, and we have to become really serious about organizing self-defense for our people and organizing different ways to get this government to monitor and enforce standard human rights around these issues,” said Sanyika Bryant, of the Malcolm X Grassroots Movement, which has written reports on the continued problem of police brutality. The woman was later identified as Marlene Pinnock and lawyers for her family were blunt: “When you look at it and you see it’s a White police officer, a big male police officer and a Black female, you wonder whether there was a sub consciousness that she did not matter because she was a Black female?” asked Atty. John Burris, who represents the family. In a series of private meetings, press conferences and rallies, activists condemned the July 1 assault on the 51-year-old mother, grandmother and great grandmother—who is reportedly mentally ill and homeless—along California’s 10 Freeway. Ms. Pinnock is very physically bruised and very emotionally traumatized, said Atty. Harper during a July 10 press conference in front of the Los Angeles Sentinel newspaper. She stood with Ms. Pinnock’s sister, daughter, son-in-law, civil rights lawyer Burris, Sentinel publisher Danny Bakewell, Sr., and community leaders and activists. Atty. Harper also spoke during a Saturday rally hosted by the National Action Network at Leimert Park on July 12.